With the help of a new computer with 4GB of RAM I have been able to stitch very large images. 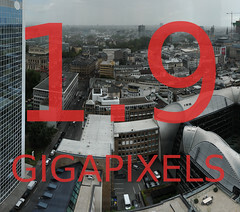 My newest record is 1.9 Gigapixels, from 372 images shot over a 15 minutes span. The weather conditions were not good, and the exposures vary a bit over the image. On the flickr page of the image I have additional details; if you want to view the full image you can do that on GigaPan. This is a Flickr badge showing photos in a set called Best pictures. Make your own badge here.